Remote Control Function! Important feature of this professional spy camera, compare now! It is a new kind of bathroom pinhole camera. If there is something precise you want to record and without others realize, this product will help you so much. 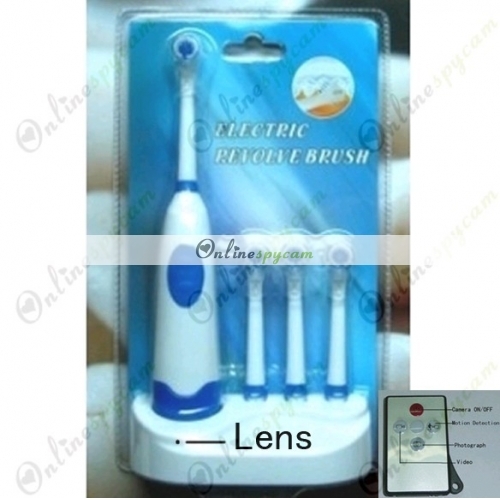 Through the advanced technology, the electric toothbrush is waterproof, so when you use it for brushing, there is no need to worry about the pinhole camera. When you use the spy camera to record videos, you can brush teeth at the same time. How wonderful! In order to get clearest videos, the technology is upgraded. The resolution of the camera is up to 1280x720. In addition, according to the large capacity battery and large amount memory card, it can work for about 10 hours continuously. You can put it in the bathroom and use the remote control unit to operate the recording work in a long distance. This product has excellent disguise. Nobody would notice the shooting easily. By this high-tech Toothbrush Spy Pinhole Camera, you can shoot everything which you are interested in. After that, you can appreciate the amazing videos on the suitable device, especial good on the computer. Have a need to shoot something secretly? This product is a wonderful choice.